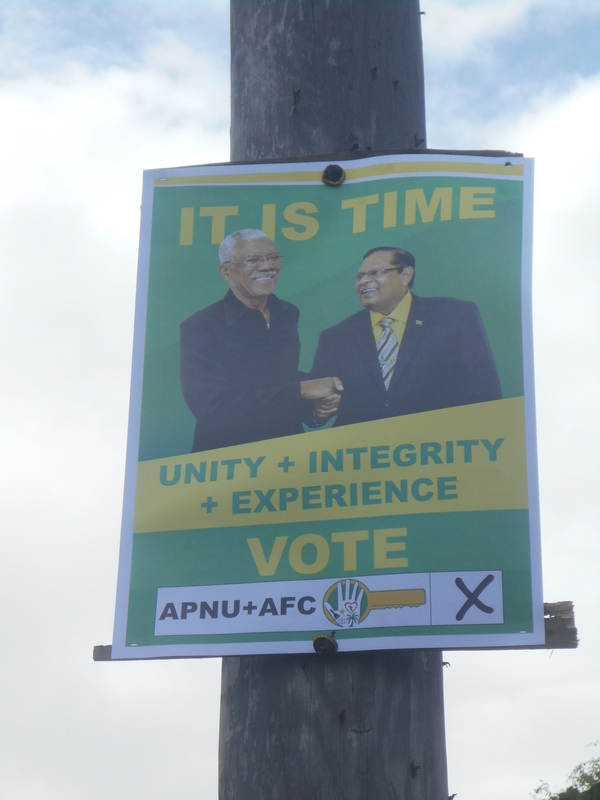 Election season is upon us in Guyana. So far, nothing too extreme has happened, but I’m kind of just waiting for the other shoe to drop. This is the only country other than the United States that I’ve ever been in this close to an election. Obviously, Guyana is a little less stable when it comes to stuff like this; however, I’ve heard rumors that Guyana may be a nation that other developing nations can model themselves after if this election goes peacefully. The two opposing parties–okay there’s actually three–but the major two parties are campaigning hard right now. They have crummy commercials that pop onto the television at random times, radio ads that preach their promises, and, most comically, posters plastered around the city on telephones polls. As if this were a campaign to be in student government in middle school. It goes to show you how small this country really is. A typical campaign poster seen around the streets of Georgetown. This entry was posted in Guyana, South America and tagged election, elections, Guyana elections. Bookmark the permalink. I’m laughing. When I was very young, in my small suburb of Pittsburgh it was common for cars/trucks to drive around making announcements through loudspeakers. Sometimes the message was political. Mostly though, it was to announce church fairs and things like that.